Former Hockwell Ring ABC boxer Linus Udofia has been tipped to hit the big time by fellow Lutonian Kay Prosper, ahead of his pro debut at York Hall this weekend. Udofia is up against Hungarian Gabor Balogh on the Goodwin Promotions ‘Paddy’s Day Punch Up’ bill, as Prosper, who started out with the 22-year-old at Hockwell Ring, said: “He’s been a stablemate from when he had his first amateur fight, and he was really doing good things. “You could tell he was made for the sport and the progression he’s made, I’ve seen it first hand, he’s well suited to the pros now. 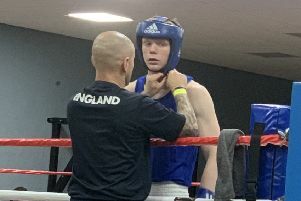 Prosper, who is also on the same bill against Terry Needham for his eighth pro bout, has offered some words of wisdom too, saying: “My first fight was, I got the win, but certain factors allowed me not to maybe look as good as I should. Playing up to the crowd, getting carried away with trying to do too much and not just concentrating on my boxing. About his debut, Udofia added: “Training has been phenomenal, this the hardest I’ve ever trained. I’m on weight too as I feel great and ready to go.